NTID Performing Arts debuts their production of <em>Sherlock Holmes and The Crucifer of Blood</em> at Panara Theatre, May 5ï¿½8. Pictured here, from left to right, are RIT/NTID students Nicole Shay, Zachary Bridgett, Nic Shaw and Kelsey Lindhorst. Later this week, National Technical Institute for the Deaf Performing Arts at Rochester Institute of Technology will debut its production of Sherlock Holmes and The Crucifer of Blood, written by Paul Giovanni. 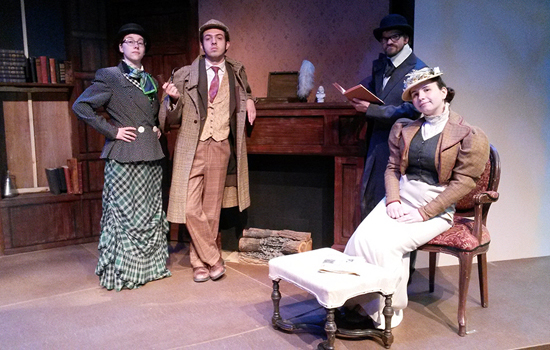 The play—an adaptation of Sir Arthur Conan Doyle’s Sign of the Four—will be performed at NTID’s Panara Theatre in Lyndon Baines Johnson Hall at 7:30 p.m. May 5 and 6; midnight on May 6; and 2 p.m. May 8. The performance also marks an end to director Jerry Argetsinger’s 41-year career at NTID. The show opens in India, where a group of British soldiers has stolen a royal treasure and signed a blood oath to protect its secret. Thirty years later, in England, the men are murdered one at a time. The daughter of one soldier calls on famed British detective Sherlock Holmes to uncover the secret and the curse and track down the killer. The story moves from India to England’s Baker Street to a sinister opium den to a boat on the Thames River—all leading to the eventual revelation of truth, revenge and guilt. Tickets—$5 for full-time students, senior citizens and children, and $7 for everyone else—are available at the NTID Box Office, first floor of Lyndon Baines Johnson Hall. For more information, email ntidtix@rit.edu.